This beautiful AB rainbow coated velvet base gives this paper weight a wonderful colour, that changes with light conditions. 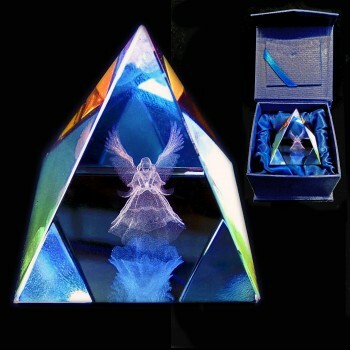 The angel is laser etched inside the pyramid and will last for many years to come. Presented in a stylish blue satin lined box that makes this item a truly stunning quality gift for any occasion. Absolutely gorgeous. Well worth the price. Colour is brilliant and defined even when not in direct light. Perfect for all ages. Comes beautifully packaged in its own satin lined box. Would have no hesitation in recommending, so much so I have now ordered 2, with a further one being ordered by my mum.